For those of you who are playing more golf just recently—because the weather's been better or thanks to the motivation and excitement brought on by the Masters (congrats, Tiger!!) - , the Hole19 Tour'19 is our monthly celebration (you know, Hole19 > 2019 > '19) and our way to thank all of our Hole19ers for supporting us! 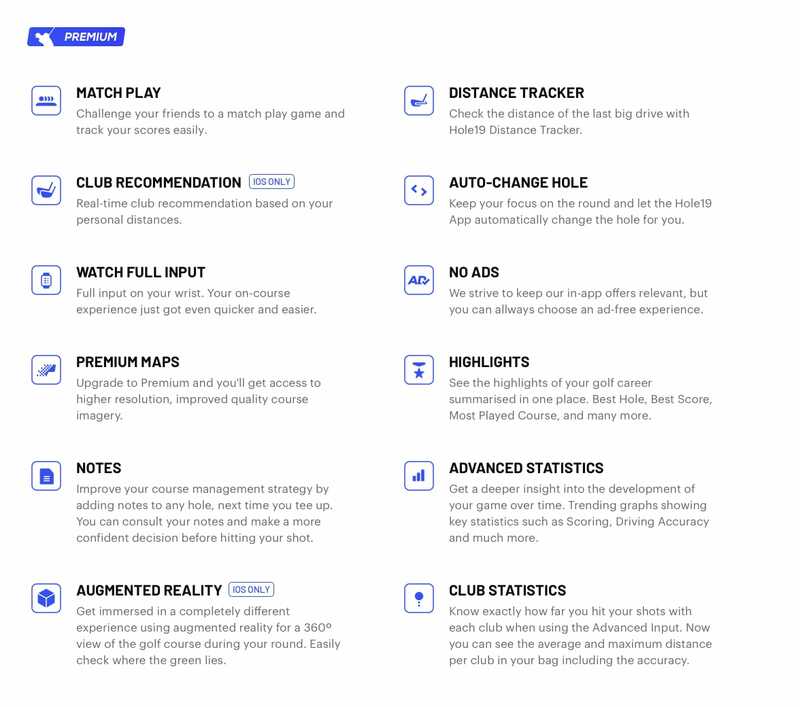 We unlock ALL Hole19 Premium features to everyone on the 19th of each month, showcase one of our features (see below) and reward 19 random golfers with one month of Hole19 Premium Pro (Website subscriptions). All you need to do is open your Hole19 App on that very day to find all features unlocked, and play a round to be in with a chance of winning Premium Pro, or the ultimate final prize which we will be giving away at the end of the year. You can see the current leaderboard here and read the full announcement here. 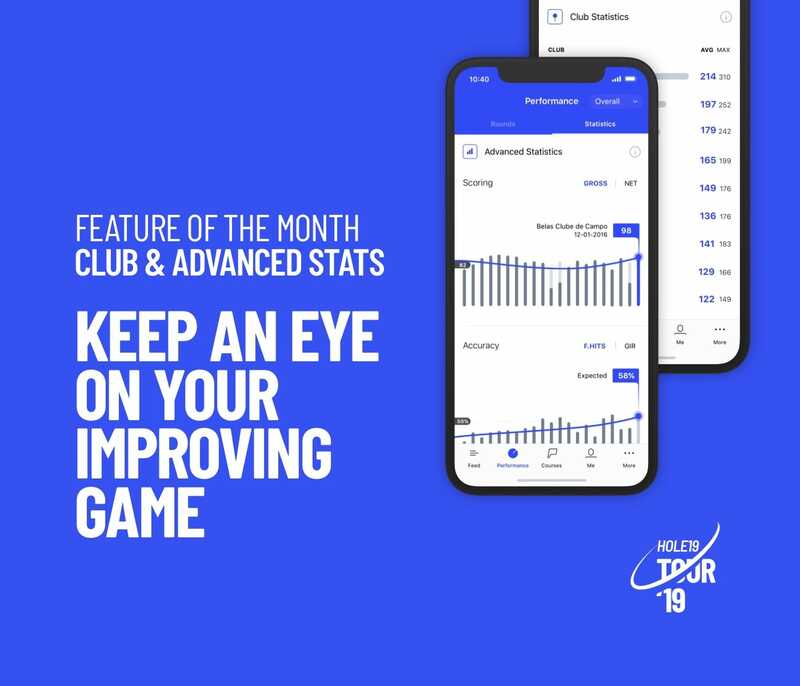 Hole19's Advanced Statistics let you see the development of your game and expected future progress with trendline graphs of your key stats, including Scoring, Driving Accuracy, GIR and Putting; while Club Statistics will give you insight into all the clubs in your bag, allowing you to see the real distances for each one. All of that in a very easy, intuitive way. Taking a deep look at all of your stats, at your recent and over time progress, and understanding your club choices is really important as it helps you see where you stand and what to focus on next in order to keep improving your golf game. So, with Hole19 Premium, you will be able to see if you're headed in the right direction or if you need to work on a specific area, as well as getting the extra motivation that we all need! GOOD NEWS! We're revisiting last month's challenge again (because you need to play in Advanced Input mode to get all of your stats)! So then, are you ready to go on the 'hunt' for better scores this Friday? Remember, all Hole19 Premium features will be unlocked on April 19 and you don't need to do anything, just open your app and enjoy some good golf time! Ready? Keep an eye on your improving game! a) Every 1-month subscription includes a 7-day free trial, if the member has never had a trial before. b) Each winner will be given a unique promo code that must be redeemed on the Hole19 Website. c) If the winners are already Premium on web members, 1 month will be added to their current subscription. d) If the winners are already Premium members that subscribed through the App Store or Google Play, they will access their 1-month offer once the current subscription is finished, this includes Premium Lite subscribers. Click here to learn how to change between subscription platforms. e) One single member cannot win the monthly prize more than once (to make it fair to the other Hole19ers). a) 19 Hole19 Premium subscriptions valid for 1 year (via the Hole19 Website, same conditions as with the 1-month subscriptions). b) 3 Grand Prizes yet to be revealed. a) The round is played on Stableford, Strokeplay, Match Play or No Scoring modes. b) The total duration for 9 holes stands between 1h05m and 3h45m. For 18 holes, the duration must be between 2h06m and 7h30m. c) The GPS matches the golf course location where the round is played. d) Hole19 reserves the right, in its sole discretion, to disqualify any round that tampers with the entry process. b) 5 points per completed challenge. 5. From March onwards, as members begin to accumulate more points, we will be sharing the Top 19 that will be competing for the Final Prizes.